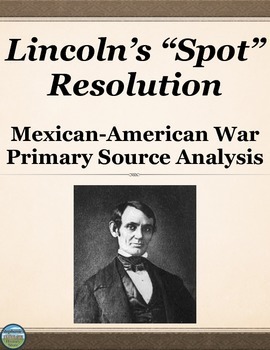 Students read a short passage on the Mexican-American War, Lincoln's Spot Resolution, and answer 12 questions including 2 large, multi-part, reflection/discussion questions. 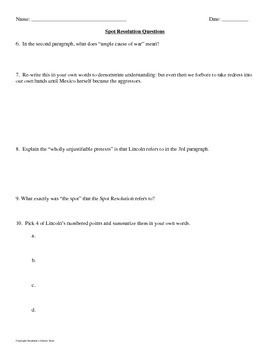 The activity concludes with a half academic/half creative question. This would be great for a sub! The answers are included where appropriate. 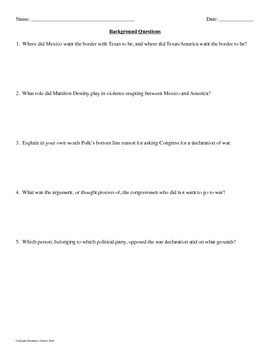 --What role did Manifest Destiny play in violence erupting between Mexico and America? --What was the thought process of the congressmen who did not want to go to war? 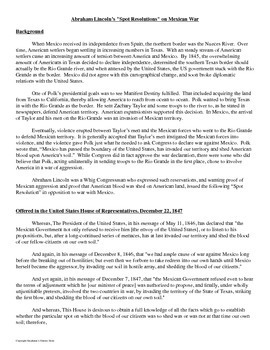 -- Re-write this in your own words to demonstrate understanding: but even then we forbore to take redress into our own hands until Mexico herself became the aggressors. --Explain the “wholly unjustifiable pretexts” that Lincoln refers to in the 3rd paragraph.